This is a splendid Victorian building in a prime location, overlooking the promenade. A warm inviting atmosphere, so you and your family can comfortably capture the essence of Llandudno. The Grand Hotel provides modern amenities, superb entertainment and it is proud of its quality service and hospitality. Satisfy your appetite for dinner at the hotel's restaurant, or stay in and take advantage of the room service (during limited hours). Wrap up your day with a drink at the bar/lounge. Full breakfasts are available daily for a fee. "Our Llandudno Clarence hotel is the ideal base for exploring the beauty of North Wales. It's a stone's throw from Llandudno beach, and not far from the famous pier and nature reserve. Take in the breath-taking scenery on a tram ride to the summit of the Great Orme. History buffs can step back in time to explore the WW2 Home Front Museum and fine medieval castle at Conwy. All rooms feature a comfy king size bed with four plump pillows and a cosy duvet. Guests can enjoy a wide variety of food and drink choices within easy walking distance from this hotel." Make yourself at home in one of the 10 guestrooms. Complimentary wireless Internet access is available to keep you connected. Conveniences include coffee/tea makers, and housekeeping is provided daily. When you stay at Llandudno Bay Hotel in Llandudno, you'll be on the beach, within a 10-minute drive of Conwy Castle and Great Orme. This 4-star hotel is 0.1 mi (0.1 km) from Promenade and 0.1 mi (0.1 km) from Llandudno North Shore Beach. 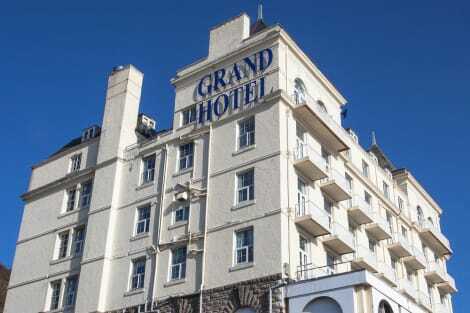 Looking out over the bay from one of the finest locations on Llandudno's famous Victorian promenade, the hotel’s grand historic exterior conceals comfortable en suite rooms, many with stunning views. Looking out to sea from the promenade, the hotel has excellent views of both the Great Orme and the Little Orme at either end of the bay. The hotel’s 2 comfortable lounges are great spots from which to view the bay and the sea-facing rooms also offer sweeping views of the coastline. All of the comfortable en suite rooms are tastefully decorated and well equipped, with TVs, central heating and tea/coffee making facilities. A continental buffet breakfast and full English breakfast cooked to order is offered each morning. The property has a level 5 rating for Conwy County food and hygiene award. Parking for motorbikes, bicycles and mobility scooters is available at the rear of the property. The hotel is close to Llandudno’s Victorian pier and the bandstand. The town’s main shopping area, Mostyn Street, is just 100 metres away. The hotel has a full bar licence. When you stay at Headlands Hotel in Llandudno, you'll be near the beach, within a 15-minute drive of Conwy Castle and Great Orme. This hotel is 0.2 mi (0.4 km) from Great Orme Tramway and 0.4 mi (0.6 km) from Llandudno Museum. Wales's largest seaside resort, Llandudno is a charming, traditional town on the north coast which still retains its Victorian character and elegance. Book one of our Llandudno hotels and discover a beautiful town which lives up to its oft-quoted title of the queen of the Welsh resorts. Llandudno's main beach, called The North Shore, has both golden sand and shingle, and follows a curve between the Great Orme headland and the smaller Little Orme. Alongside the beach is the wide Victorian promenade, separated from the road by low walls, benches and flowerbeds. Here you'll find the town's theatre, Venue Cymru, a swimming pool and a bandstand. There are plenty of traditional seaside attractions on the beach, including donkey rides, Punch and Judy shows and boat trips. The Victorian pier, built in 1858, has shops selling souvenirs, ice cream, rock and candy floss, arcades and a café and is a popular spot for fishing. Llandudno also has a second, quieter beach, the sand-dune-lined West Shore. You can climb up the Great Orme, several hundred feet above sea level, and enjoy excellent views from the summit as far as the Lake District. If you don't fancy the walk, take the Edwardian tramway or the cable car. You can go skiing, snowboarding, tobogganing or sno-tubing down the mountain at the Llandudno Ski Centre, which offers skiing and snowboarding lessons for adults and children. You can also explore the Great Orme copper mines inside the mountain, which date back to between 1860BC and 600BC. The area is home to a variety of seabirds, including guillemots, kittiwakes and razorbills, as well as endangered butterflies and a variety of wildflowers. There are two parks here – Haufre Gardens and Happy Valley gardens. At Bodafon Farm Park, kids can go pony riding, take a tractor ride and meet a variety of animals, including llamas, deer, pygmy goats and rare breed cows. You can buy animal feed and feed the goats, deer and llamas, see the newborn lambs and calves in spring, ride on kids' tractors or enjoy the adventure play area. You can also see the owls being bred by the North Wales Bird Trust. The MOSTYN contemporary art gallery has six exhibition spaces dedicated to Welsh and international art – there is no permanent collection, just a series of temporary exhibitions. There's also a shop selling books, cards and craft items from around the United Kingdom, including jewellery, glasswork, ceramics and textiles. For a wide range of food, including tapas, admirable cakes and the popular eggs benedict, head to the welcoming Orient Express, a TripAdvisor Certificate of Excellence 2014 winner. Most of the food is British, but there are some Turkish treats too, including homemade baklava. Enjoy cakes, pastries and teas at the family run Characters Tea House and Restaurant, or on Friday and Saturday nights, steak or fish which you cook to your liking on volcanic rock. The multi-award-winning Cottage Loaf pub, another TripAdvisor Certificate of Excellence winner, serves homemade food and cask ales, and has a log fire in winter and gardens in summer.